This model is similar to the Sylvia model 610 but it is built wider to accommodate larger sewing and quilting machines. The 810 can be used in place of the 610 cabinets in our model 1350 corner unit and model 1000 sewing/serger combination. 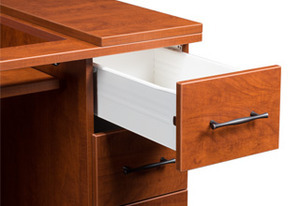 Create more space on the 810 by adding both a model 490-QW quilt extension and the model 490 drawer unit. The uniqueness of Sylvia's modular design allows for this wraparound sewing cabinet that accommodates two of the newer, larger sewing, quilting, and embroidery machines. The expanse of work space and storage area puts what you need conveniently within reach. Maximum storage for accessories, threads and books. Sylvia Design does not offer inserts for sergers. 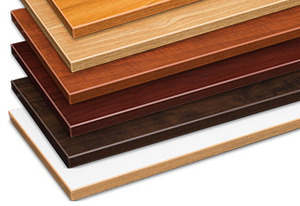 Colors: Available in White with Oak Trim, Grand Cherry, Castle Oak, Twilight, and Teak. The model is the same as the model 810 except it has the quilting extension. It too has a larger area to accommodate larger quilting and sewing machines. 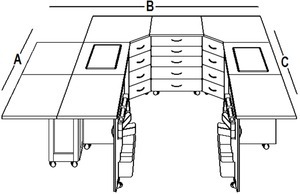 Increase more space to this model by adding both a model 490-QA quilt extension and the model 490 drawer unit. o Machine Opening: 24-1/2" × 12"
The model 490 is a 5 drawer sewing chest to be used independently or together with the cabinets. 5 Large Drawers for all your storage needs. Colors: Available in White with Oak Trim, Grand Cherry, Castle Oak, Mahogany, and Teak. Four Large Drawers for all your storage needs. How Rudersberg Hydraulic Lift from Germany on Sewing Cabinet Works. This video represents a small demonstration on how the hydraulic lift system works for Sylvia Design sewing cabinets. Six Finishes: Sylvia finishes are durable - heat, scuff, scratch and stain resistant. Choose from any of the six beautifully rich colors that Sylvia has to offer: Sunset Cherry, Mahogany Clove, Brown Pearwood, Teak, Castle Oak, or White with Oak trim. Every Sylvia cabinet is completely finished front to back, inside and out. Rudersburg Hydraulic Lift. 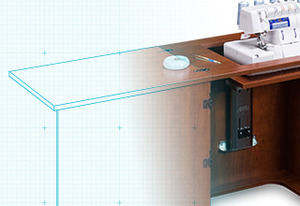 Each Sylvia sewing cabinet features the ease of the Rudersburg lift to move your machine to the desired position. Imported from Germany, this high quality lift has 3 different heights that are fully adjustable for your brand and model of sewing machine. The lift effortlessly raises your sewing machine or serger from the bottom closed position to the flat sewing position. Lifetime Warranty. 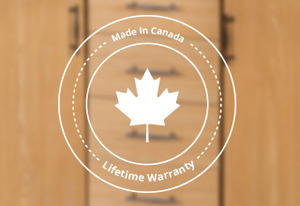 We believe in our workmanship and materials so much we warranty our cabinets for as long as you own them. We have been in business taking care of customers for over 35 years. Designed & Customized For You. You choose the model(s), colors, and accessories that fit your sewing and quilting style. Sylvia sewing cabinets are designed with your future in mind. It is easy to add and connect additional cabinets, drawer chests and other accessories when future needs warrant. If you have unique needs and prefer a different size, height, etc. just give us a call and we’ll get it done. Solid Construction. Quality materials, quality workmanship and customer satisfaction are the hallmarks of every piece of Sylvia Sewing Furniture. Top quality hardware from solid bronze hinges to modern drawer pulls. Sylvia cabinets come fully assembled (except for the casters). Easy to Use & Move. All Sylvia cabinets are designed with center-of-the-needle sitting position which increases visibility and decreases back strain. Locking commercial grade casters make your cabinet easy to move, or remain securely in place. 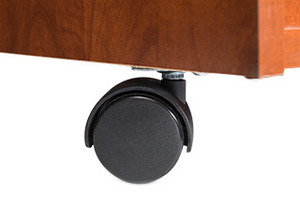 Heavy duty metal drawer glides are smooth and will last a lifetime.